Although the bites of certain insects are frequent throughout life, there are certain cases that are important and urgent medical attention is required. This is the case of scorpion stings, which are very painful and can endanger the life of the person if a professional is not immediately approached and the instructions of the person are strictly followed. Although anyone is at great risk after having a bite of this arthropod, children and older adults are more likely to suffer complications. Some cases of scorpion stings in adults may not require any specific treatment, however, it is always important to consult a specialist. If you want to know more about the scorpion sting: symptoms and treatments, we advise you to continue reading the following article. Pain, which can be quite strong. Feel tingling or numbness in the body part that suffered the bite. In some cases there may be slight swelling around the sting. Feel contraction in various muscles of the body. Begin to perform uncommon movements in the neck, eyes and head. Drooling or sweating for no apparent reason. To have tachycardia, that is, feel the fastest heart rate. Presenting cardiac arrhythmias, that is, irregular heartbeats. Children may start crying in a way that can not be comforted, they look restless or excited. There are several occasions in which you do not need to perform any medical treatment, but when symptoms of severity are manifested it is necessary to go to a health center urgently and receive the treatment that the specialists consider indispensable depending on of the person and the symptoms that it presents. They may consider it necessary to administer sedatives that are used to relieve muscle discomfort and the use of different intravenous medications to regulate blood pressure, heart rate and pain. Using an antidote for the scorpion or scorpion bite remains a controversial treatment because of concerns about its effectiveness and the side effects it can cause, however, the antidote can be more effective if administered before that the symptoms appear, so some children need to apply this antidote as a method of prevention. Wash and disinfect the area. Use of analgesics every 8 hours. Once in the chamber, doctors can infiltrate local anesthesia and antibiotic and tetanus prophylaxis. While anyone can suffer a scorpion sting, there are certain risk factors that increase the likelihood of suffering this event. Among them are certain geographical areas with the conditions for the scorpions to live and in which they are abundantly distributed. They are mainly found in South America, Mexico, North Africa, India, the Middle East and some parts of the United States such as New Mexico, Arizona and California. Also, there are some environmental factors that can contribute to the existence of scorpions, since they can live under rocks, the bark of trees, trunks, among others. This is why it can be common to find this type of arthropod when camping or if the house is located near the field. Move the piles of stones or wood that may be around the house and not keep wood inside the home. Keep grass trimmed properly, pruning overhanging bushes and branches of trees. Inspect and shake the garden clothing, i.e., boots, gloves and all the clothing used for these jobs. It is preferable to use long pants with long-sleeved shirts when camping or hiking. 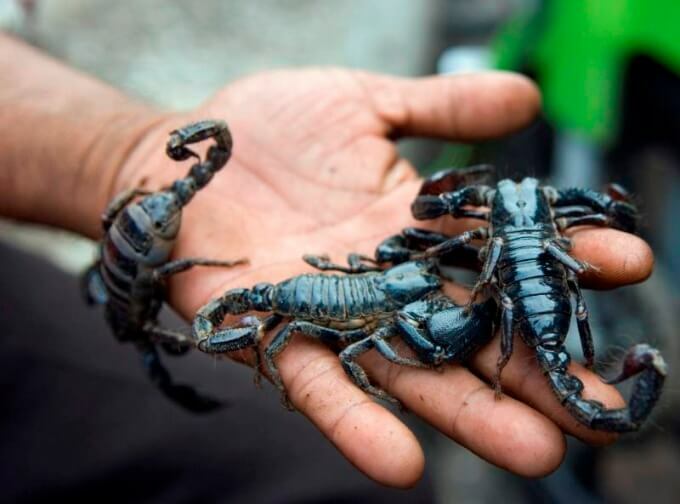 If you travel to a place where scorpions are frequent, it is important to shake the bed-sheets before sleeping and be careful not to leak anything in the suitcases with the clothes. When finding a scorpion you can use long tweezers to move it away with great care.